Scientific and medicinal info - Heather is an evergreen shrub that grows all over Northern Europe, and is associated with the moors of Scotland and England. The spikes of flowers come in white, pink, red and purple. 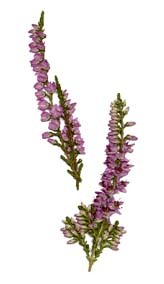 Medicinally, teas made from heather flowers is a diuretic and could be used to treat urinary infections. Heather is related to the rhododendron. Using heather in rituals - Heather is used in weather magick, often with fern. Burning the two herbs together can attract rain, or simply wetting them and sprinkling drops of water onto the ground. Another ritual use for heather is to call positive spirits and energy. You can also carry heather flowers for good luck and protection. If you are doing rituals for initiation or self-dedication, you might want to include heather blossoms. They are associated with beginnings and self-discovery. Heather can also bring peace to a home or between 2 people when there is conflict. In the Celtic Ogham alphabet, the letter U (ura) is associated with heather. DISCLAIMER: No information within this POST should be considered medical advice. Please do further research or check with a physician before using any of these herbs in a medical fashion. The Celtic bard Ossian had a beautiful daughter called Malvina, Malvina was not just beautiful she was a good person too. The fair maid Malvina was engaged to be married to a brave and handsome warrior called Oscar. One bright sunny summers day Malvina was sitting outside listning to her father's singing and playing , she sowing a the last pieces of her wedding gown. It was a peacful happy day, the birds accompanied the bard and the water from the nearby burn gurgled and danced over the rocks. Away in the distance she spotted a lone figure limp and stumble over a near by ben. Malvina immediately dropped her sowing and ran to help the injured traveller, but as she drew closer she could began to recognise the man. It was Oscars servant and he was badly injured. Malvina felt her heart sink, she knew just by looking at the ragged man she would never see Oscar again. The messenger fell down infront of her exhausted and gave her apiece of purple heather which Oscar had pulled from the ground as he had died. The heather was to show Malvina his undying love and that his last thoughts had been of her. The lassie was heart broken, her tears flowed like the burn and as she cried the tears washed the purple from the heather and the heather became white. Ossian finally reached his daughter and helped her and the messenger back to thier home, and all the while Malivina wept and her tears washed the purple which grew all over the glen. Where ever her tears fell the heather turned white. Through her misty eyes the lassie noticed this change and she fell on her knees and prayed to her Goddess that others might never be as unfortuante as her and that this white heather be a token of good luck to all who found it and plucked it. I recognise the name Ossian, isn't that the Scottish name for Oisin son of Fionn mac Cumhaill and a warrior of the Fianna? Ossian is a legendary warrior bard who appears as the narrator in the Celtic legends of Fionn mac Cumhail. Fionn mac Cumhail was a legendary warrior of Irish mythology. The basis for most stories about him come from the Fenian cycle, supposedly narrated by the bard Ossian. According to legend, Fionn was a famous leader of the Fianna warrior/hunters, after whom the Fenian Brotherhood named themselves. Yes, more or less correct. Ossian was the name that Scottish teacher James McPherson gave him in his tales which he purported were translations of what Ossian himself had written. It later turned out that they were in fact a mixture of Irish Gaelic tales from the Fenian Cycle and McPherson's own original work. Oisin was the Irish name for Fionn's son, originally. But you did well! Oh that reminds me of old Stribog! Oisin was the Irish name for Fionn's son, originally. But you did well! Maith thu, a chara!